Water beads are one of the most versatile, convenient and beautiful vase fillers you can use. Wedding and event décor requires perfection, right down to the fine details. Pliable water beads are the easiest way to fill glass vases and other containers to create a gorgeous, shimmering wall of color that makes your venue look absolutely breathtaking! You will need a container that’s much bigger than the dried water beads. A single 340 gram bottle can grow to as much as 60 times its original size to a total of 15 gallons. If you plan to use different colors, make sure you have a different container for each water bead color (unless you plan to mix them). This will allow you to create single-color containers or to work with layers. Soaking water beads takes many hours, so make sure you start well in advance. It is best to allow your beads to soak for between four and eight hours to ensure that they reach their biggest state. Place them out of the way in an area where pets and children won’t be able to disturb your water beads. If you plan to use water beads to fill live plant pots, remember to spray them with water once every two to three weeks. Once your beads are soaked, it’s time to start filling your beautiful vases or glass containers! Simply pour the beads into the container and observe as it instantly takes the form of the container. Remember to add other necessary items first, like bouquet holders or flower stems, so your colorful water beads fill the area around objects without overflowing. 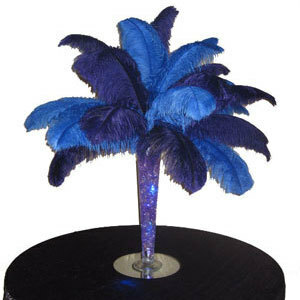 Our water beads are commonly used in ostrich feather centerpieces. Table Linen Care: Instructions That Will Make Your Linens Last Longer!